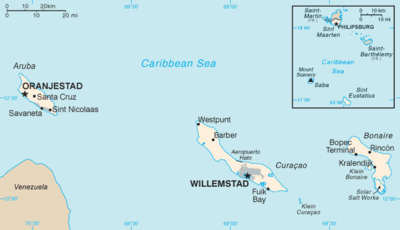 The Netherlands Antilles participated at the Olympic Games from 1952 until 2008. As a constituent country of the Kingdom of the Netherlands, it supported the Netherlands' boycott of the 1956 Games and also joined the American-led boycott of the 1980 Summer Olympics. The Netherlands Antilles participated in the Winter Olympic Games twice. 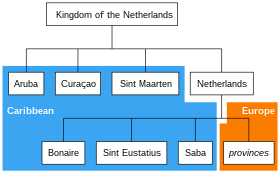 The Colony of Curaçao and Dependencies was a Dutch colony from 1815 until 1828 and from 1845 until 1936. 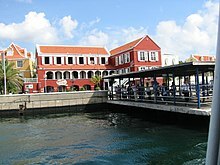 Between 1936 and 1948, the area was officially known as the Territory of Curaçao, and after 1948 as the Netherlands Antilles. With the proclamation of the Charter for the Kingdom of the Netherlands on 15 December 1954, the Netherlands Antilles attained equal status with the Netherlands proper and Suriname in the overarching Kingdom of the Netherlands. 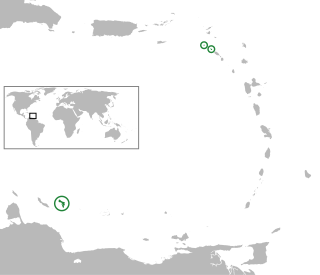 Nowadays the territory is referred to as the Dutch Caribbean and no longer Netherlands Antilles. In the Kingdom of the Netherlands, a Minister Plenipotentiary represents the governments of the Caribbean countries of the Kingdom in the Netherlands. The minister is part of the government of the Caribbean countries, but resides in the Netherlands, where they are part of the Council of Ministers of the Kingdom of the Netherlands.